The master stateroom forward features a large offset queen berth, hanging locker, drawer storage, storage lockers, two opening ports, an overhead hatch and direct access to the head. The salon is full beam and accessed through sliding doors from the cockpit features a L-Shaped settee to starboard, a U-Shaped dinette to port which also converts to sleep two and an entertainment center forward to starboard which features a Samsung TV with a Sony Blue Ray and a Kenwood AM/FM/CD stereo with remote. Located forward of the salon to starboard across from the galley is the head which has a vanity with sink, vacuflush head, large stall shower with seat, Vanity, storage locker and an opening port. The cabin is spacious and on a single level, has cherry wood cabinetry, Corian countertops. 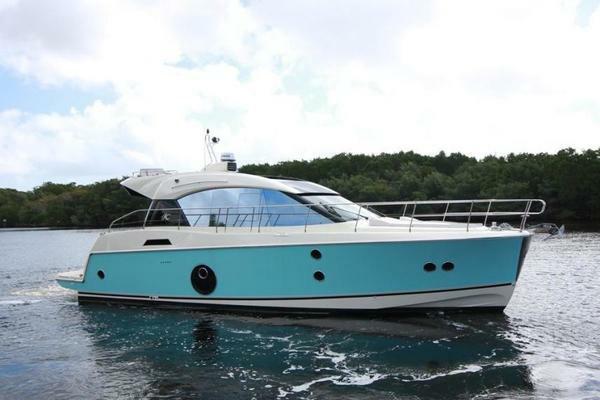 United Yacht Sales New Jersey would love to guide you through a personal showing of this 35' Carver Mariner 350 2001. 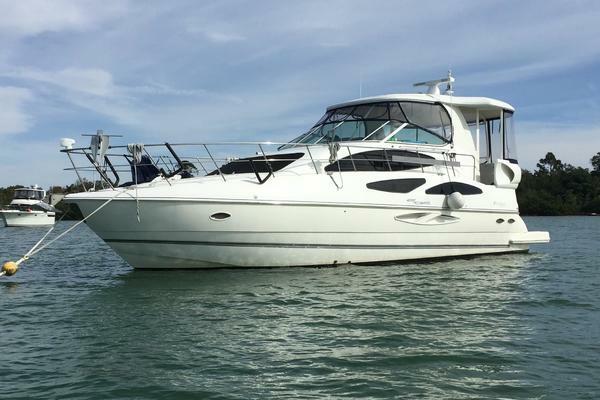 This yacht for sale is located in Merritt Island, Florida and priced at $59,500. For a showing please contact us by filling out the form on this page and we will get back to you shortly! The salon is full beam and accessed through sliding doors from the cockpit features a L-Shaped settee to starboard, a U-Shaped dinette to port which also converts to sleep two and an entertainment center forward to starboard. Located midship to port, the galley features a round stainless steel sink, Princess dual burner stove with oven, AC/DC full size refrigerator/freezer, Haier microwave, built-in coffee maker, wood flooring, Corian counters and plenty of cabinets and drawers for storage. Nestled in the bow of the boat with a slanted island berth, with two portals and overhead lockable hatch you have an open and inviting cabin comfortable for extended cruising with an en-suite head. Located forward of the salon to starboard across from the galley is the head which has a vanity with sink, vacuflush toilet, large stall shower with seat, medicine chest, storage locker and an opening port. If your looking for comfort or entertaining then this really fits the bill in a small package, great layout.